→Granberg Chainsaw Mill Model G777. Best Alaskan Sawmill? Granberg Chainsaw Mill Model G777. Best Alaskan Sawmill? You have logs that you want to turn into boards. You have a medium-size chainsaw (up to a 20" bar). You need a Granberg G777 Chainsaw Mill! If you've got logs under 18" diameter to mill (and aren't going into milling as a business), an Alaska chainsaw mill like the G777 small log mill can do the job for you and save you the expense of buying a dedicated saw mill. The Husqvarna 455 Ranche﻿r , the Husqvarna 460 Rancher as well as the Poulan Pro pp5020av are all suitable for use with this equipment. 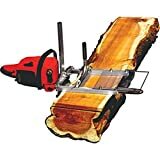 What size logs can I mill? Can I use this with an electric chainsaw? Will using this burn out my chainsaw? Granberg Slabbing Brackets (for a great first cut). The Granberg G777 Alaska Chainsaw Mill is a very popular tool; for example, it is the #1 best seller on Amazon in the milling machines category. It does not require a huge chainsaw, and at under $200 most anyone can afford one. You don't have to turn very many logs into lumber to recover that investment. Before you shell out your hard-earned cash for one, though, you probably have a bunch of questions about whether the G777 is the way for you to go. What can it do, what can't it do, will you need to purchase a bunch of other stuff as well, etc. Read on, and we'll answer those for you so you can make an informed choice. Granberg makes three models of Alaskan mills: the MK-III (comes in several sizes), the G777 Small Log mill (for bars up to 20"), and the G555B Mini Chainsaw Mill. The G777 is a great choice for the woodworker or homeowner who wants to rip smaller logs. Its main constraint is that it can be used only with chainsaws with shorter bars, which limits the width of lumber it can cut (basically, the bar length minus 2 or 3 inches). Max. bar length: Up to 20"
Granberg is a family-owned company based in the U.S. that also manufactures its products in the U.S. They have been making chain saw accessories for over 50 years, and are a leader in the industry. They market their products in both the U.S. and Europe. This mill is designed for logs 17" (possibly 18") in diameter or smaller. The milling apparatus eats up a couple of inches of the bar. It can cut boards as thin as 1/2 inch and as thick as 13 inches. The Granberg G777 is designed to be used with any brand of chainsaw with up to a 20" bar. At least a 50cc engine is recommended, the Husqvarna 60cc chainsaw known as the Rancher 460 would be very well suited to this kind of work. It may be possible to do some milling with it attached to a lower-power saw, but it will be very slow going, especially with wide hardwoods. This mill should work with any brand of chainsaw with a bar that is at least 2.5" wide. With a narrower bar, the bolts attaching the mill to the bar will interfere with the chain. While some folks report having used the G777 with 24" bars, this has several disadvantages, not the least of which is the fact of the end of the bar extending out past the end of the milling attachment. Also, the G777 attaches to the bar only at the engine end. A longer bar will do better with a mill like the MK-III, which attaches at the engine end and also at the far end of the bar, providing more stability. There are kits available to convert a G777 to an MK-III, but they are available only directly from Granberg, and take at least a couple of weeks to ship. No, an electric chainsaw, even a corded one, will not have adequate power to work with this mill. Using this mill is no harder on your chainsaw than cutting firewood. That being said, cutting a long board can keep the saw running at full capacity for a long time, which can cause it to overheat, so you may want to let it cool down between boards. Chainsaws are not immortal, and if you use yours heavily, it will eventually need to be replaced. Attentive maintenance will prolong its useful life, but 10 years is a good rule of thumb for how long a chainsaw will last. Accordingly, most manufacturers continue to supply parts for discontinued models for upwards of 10 years. The assembly process can appear quite daunting, and opinions differ on how difficult this item is to assemble. there are a lot of small parts, and so the diagram can seem intimidating. fortunately though, a very helpful couple of videos have been made​ by somebody who shows the complete process step by step. It is in two videos, and if you do purchase this very useful tool, I strongly suggest that you watch these two videos as you assemble your unit. Part one can be seen below, and part two is below that. However, you will want a ripping chain. It is possible to use this mill with a regular chain (must be very sharp), but the results will be disappointing, and it will be much harder work. A ripping chain is specifically designed for cutting parallel to the wood grain, while a regular chain is for cross cutting. The teeth are at a different angle, the guides are at a different depth, and a ripping chain will produce a much smoother cut parallel to the grain, and also produces less waste in the form of sawdust. This means you can get more inches out of a log. Having the right tool for the job can make all the difference. Do yourself and your chainsaw a favor and get a ripping chain. IMPORTANT NOTE: Do not use a ripping chain for cross cutting (like for firewood)! This will dull the chain, and can cause very dangerous "bucking" by the saw. If you want more speed and are willing to live with a VERY rough cut finish (say for fence posts or roof joists) you can use a skip chain. This has fewer cutters than a ripping chain, and therefore cuts faster. It also clears waste more efficiently and is less prone to clogging. However, it also requires more power from the saw - you'll want at least a 60cc engine for this kind of work, such as ﻿﻿the 460 Rancher from Husqvarna. Using the mill alone for the first cut (running the mill along the rounded outside of the log) will produce boards that may vary quite a bit in thickness and may need a lot of planing if they are to be used for woodworking or anything but very rough construction. The way to prevent this inaccuracy is to use a set of guide rails for the first all important cut. You can make these yourself if you're handy around the workshop, or you can buy a set ready made by Granberg. They cost almost as much as the mill itself, but using these for the first cut is highly recommended. If you are going to fabricate your own guide rail system, you can get a good start by using the Granberg slabbing brackets, they're economical, well made and will give you a great start. Chaps are strongly recommended for use with this setup. It goes without saying that you'll be using gloves and eye and ear protection - right? There are 88 user reviews and 39 answered questions about this product on Amazon. 53% of the reviews are 5-star, and 32% 4-star. That's a combined 85% 4-star and above - pretty impressive. The instructions are complicated (there are a lot of nuts and bolts), but with the videos above, this slight problem is effectively eliminated. The bolts that attach the rig to the bar are too wide for some bars (< 2.5"). The set-screw style bolts do not provide as firm an attachment as if holes drilled in the bar. The majority of users seemed very happy with this mill. One guy said he had ripped hundreds of board feet with it attached to a Poulan 36cc saw (50cc is minimum recommended). Another user reported one pecan tree yielded over $600 worth of lumber. Others report great success using it for pear, walnut, and red cedar. Users recommend letting the saw do the work. It can be slow going at times, but that's the nature of the beast. It is naturally going to be slower than a professional milling machine. Obviously, the more power your saw has, the faster the work will be. Stripping the bark from the logs is reported to keep the chain sharp longer. Best results can be obtained by using guides for the first cut, then rotating the log and cutting the opposite side with guides. After that, cut a board, rotate, and repeat. This is a great accessory for a casual user with a moderately powerful chainsaw with a bar up to 20" long. For a woodworker who wants to take advantage of wood on their property, it can save a lot on the cost of lumber. Rather than just cutting downed trees into firewood, this milling machine makes it easy to turn them into lumber for small projects like chicken coops or sheds. Granberg is a longtime industry leader in chainsaw accessories, and this product appears to be a good bet. 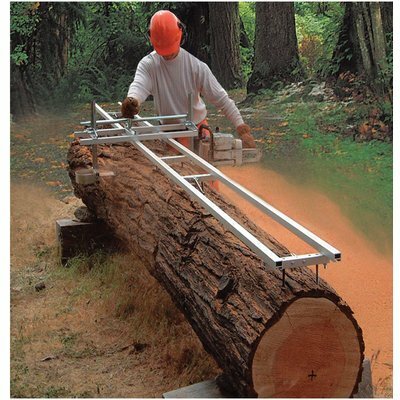 If you end up loving it and want to be able to tackle larger logs, you can upgrade to a MK-III mill to work with bars 24-84 inches in length (requires purchasing a conversion kit and handle and rail set). Of course, that will proabably mean purchasing a bigger chainsaw . . .